If you still haven’t started your spring cleaning, there’s a good chance that it’s because you simply don’t like to clean. This is nothing to be ashamed of. There are a lot of us who simply look upon cleaning as one of the most disliked chores that need to be done. On the other hand, keeping things clean has a lot of financial benefits such as increasing the lifespan of those things and areas kept clean. If you’re one who hates to clean, but also aren’t willing to hire someone to do it for you due to the expense, there is a middle ground compromise — investing in cleaning gadgets. Yes, the cleaning gadgets often come with an initial upfront cost, but they are almost always less expensive than hiring someone else to do the job and will pay off in the long run if they get you to keep your things cleaner and more organized. They should also help you save time while cleaning. Here are a few cleaning gadgets that may be worthwhile if you fall into the dislike cleaning group. Cyber Clean is a biodegradable goop that allows you to easily clean items like remotes and computer keyboards. Sometimes it’s difficult to clean items that have hard to reach places. For instance, a cleaning wipe or duster won’t always be able to reach inside tiny openings. Cyber Clean allows you to reach those difficult spots. You just place the goop (which is more of a dough-like substance) on the appliance or keyboard, press down, and then remove it. This product is a great way to clean areas that were previously left untouched and will save you a lot of unneeded cleaning aggravation. Have you ever had to scrub and scrub in order to get some crayon or a scuff mark off your wall? Maybe there’s some unidentifiable residue stuck to a wall that you’re finding particularly difficult to remove. Using Mr. Clean Magic Eraser Foam Pads might be just the thing you need. These foam pads are designed to remove dirt and grime from walls with very little effort. For less than $5, all you have to do is wipe the pad over the stain and your worries should be over! Dusting can be a time-consuming, irritating chore. Many people, however, find that using a Swiffer Duster can help them save time and money when they go to dust their house or apartment. 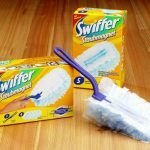 For one, most swiffer dusters are pretty inexpensive and are popular enough that you can find them on sale either in a store or online. For another thing, the dusters are simple to use, help you reach hard to dust places, and are less of a hassle than using an old rag and a can of dust spray. While the idea of a vacuum for your window may seem bizarre, a window vac is a great new way to wash your windows or mirrors. 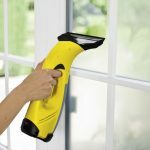 The window vac is an easier way to wash your windows and mirrors and a method you can reuse time after time without having to resort to rebuying window cleaner or sponges. And you know those dirty water streams that drip down to the bottom of the window or mirror as you’re cleaning? The window vac prevents that. 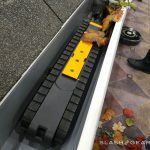 While it has a daunting name, the iRobot Looj 330 Gutter Cleaning Robot is a great tool to use to clean your gutters. Not cleaning your gutters can lead to some pretty expensive home repairs. If you don’t clean your gutters frequently, cleaning them by hand can also take up a lot of time. The Looj 300 is a quick and easy way of cleaning your gutters. Just fit the Looj 300 with the relevant paddle sizes and sent it on its way. What could have ended up being a chore that lasts a day will be finished in about an hour. If you have a pool, you know how much time is wasted cleaning your pool and how much money it costs to keep it in working condition. 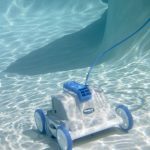 The Verro Pool Cleaning Robot takes care of both of those issues. Though initially expensive, this is a great tool to save you money and time if you plan to have a pool for several years. The device helps to improve the chemical mix and temperature circulation in the water and automatically removes all dirt, grime, hair, leaves, sand, and bacteria. This gadget will help with the upkeep of your pool and ensure a longer lifespan for your filters. Do you have difficulty cleaning around the base of your faucet or showerhead? Maybe you have grime you can’t remove from tile grouting. The Sonic Scrubber can help you with those problems saving you vast amounts of time and frustration, and making it a lot more enjoyable to keep those hard to reach places sparkling year round. 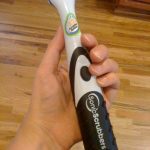 The scrubber is battery-powered and is a faster and easier way to clean hard to reach spots in your household. 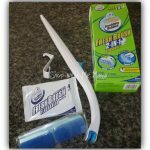 Very few people enjoy cleaning their toilet, which is why the Scrubbing Bubbles Fresh Brush Flushable is such a great product! This is an inexpensive and fast way to clean your toilet. After buying the starter kit, all you have to do is assemble the brush, fit on a flushable pad, swish it around in the water to activate the cleaner, and wipe down the toilet. When you’re done, just press the button to eject the pad into the toilet and flush. It’s that simple! If you have blinds over your windows, you know how quickly they can become dirty. Cleaning blinds is a very time-consuming activity. However, using a microfiber blind cleaner is an inexpensive way to save yourself the hassle of cleaning your blinds. These blind cleaners have flexible fingers that fit through the blinds and quickly pick up dust and dirt particles. Best of all, the material is washable so they can easily be reused. The iRobot Roomba is probably something you’ve already heard of. This device is a great floor vac that will sweep and vacuum your floors whenever you want. 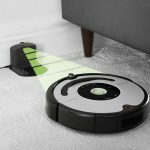 Not only will it pick up all dirt, dust, and pet hair, but it’s able to pick up dirt and dust from underneath furniture or along wall edges. Do you have a gadget that helps you keep things clean that also saves money that you don’t know how you lived without before you purchased it? I loved my roomba (I hate vacuuming), but you need to be really careful if you have pets that have accidents from time to time. I’ve had a couple of friends that have come home to situations like this which is not helpful in keeping your place clean. Okay, that was disgusting! I think I would die if I came home to that after a long day at work. I simply LOVE magic erasers. Using them on my white baseboards,any scuff marks on floors,walls, and bottom of doors is so easy and you only use WATER!!! Its almost therapeutic for me since they really work well and that satisfying feeling of CLEAN! 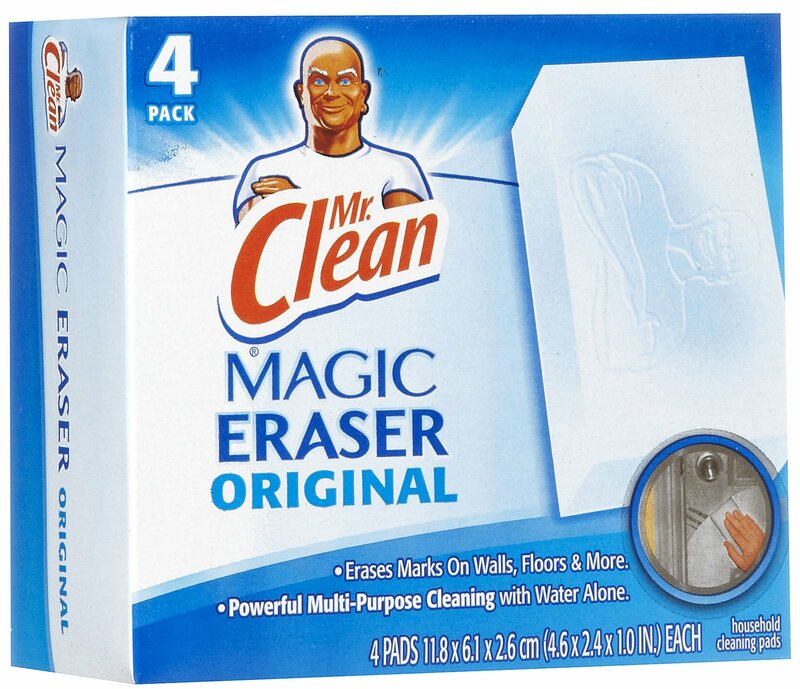 If you’ve never used magic eraser RUN to the store and get them. no kiddin! Magic Erasers work miracles! They take faucets with hard water stains and wipe them away like dust! They can wipe stray paint marks off of your wall without removing your base paint. I did wipe the numbers off of one of my oven dials with them, but that has been the only mishap. Scuff marks come off floors. These things really take the place of elbow grease! I’ve never heard of a gutter cleaner before. Does anyone know if they actually work well? I have to pay for someone to come and clean our gutters twice a year because my dh has a bad back and I don’t feel comfortable climbing up and down the ladder. This might be helpful if it actually works, but we get so many leaves in our gutters from a huge tree that overhangs the house that I’m worried that it wouldn’t be effective. Instead of a Roomba I have a Neat-O, its great, probably better than the Roomba even. I have all wood floors and its set on auto to clean while I’m at work, I LOVE it! I KNOW it saves me time!